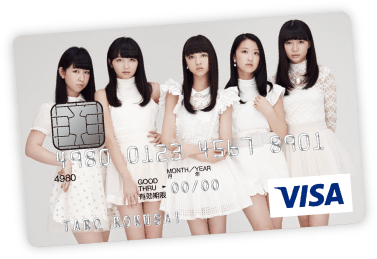 Tokyo Girls Style Original "Tokyo Girls Style VISA CARD" unveiled! This campaign is in collaboration with Tokyo Girls Style and Mitsuisumitomo VISA Card. That launched Tokyo Girls Style VISA Card! We've accepted your applications in the live venues or online! You can get special favors when you become a member! Exchange your point to the items only for the members according the deposited points. Get a live tickets (pair tickets) ＋Invitation to the Backstage (only members). Get a hand print with the autograph by hand writing on the fancy paper. This is the items you can get only as a member. Present 「the autograph and message on the 2L size photograph」 to the first 500 arrivals. ※autograph and message are coped. Get a present 「The souvenir in London selected by all members and the proof photos」! ※Only prize winner notice the win with the present. We are still planning services only for members for 「Tokyo Girls Style VISA CARD」 from now on! You can't miss it . Please apply now! Also it will be available from mobile phone or PHS.